The last month of winter is the time when we all need more energy to make our way to spring with its delicious and fresh fruits and vegetables. February is the ideal month for eating Azerbaijani scrumptious Piti. Piti is a soup prepared in the oven in individual pots. The soup is made of mutton and vegetables, infused with saffron water adding flavor and color to it. The dish attracts all Azerbaijanis not only with its good smell, but also with its appetizing serving in the crocks, accompanied by an additional plate to separate the soup and the meat, eaten with raw onion and sumac. 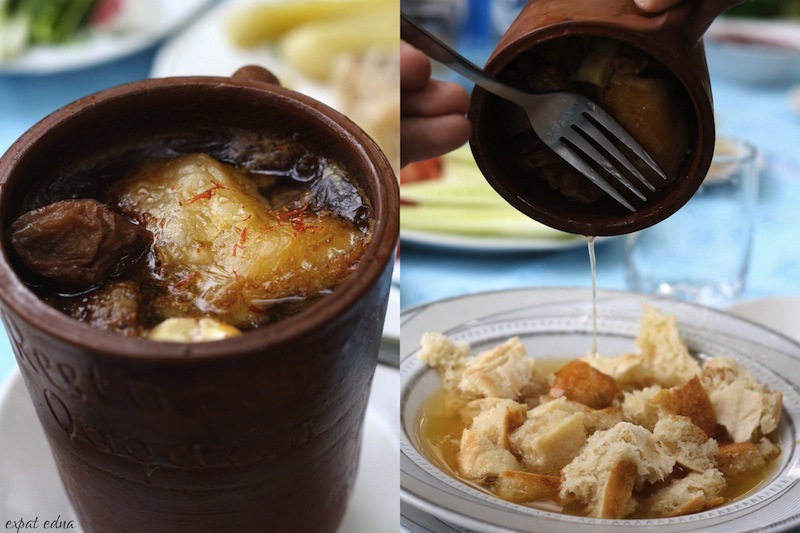 This meal is the symbol of Sheki, a magnificent mountain city located 370 km away from Baku. It is worth to spend the weekend in Sheki to eat spicy Piti which is cooked in special earthenware pots in eight-nine hours. However, those, who could not drive down Baku, should not get upset. You can cook this soup at home or go to restaurants of traditional cuisine. If you choose the roads less travelled, bear in mind that long and slow cooking is the secret to a good Piti. To cook Piti for five persons at home you need: 1 kg boneless lamb, 200-gram lamb fat, chopped into 50 gram pieces, 500 gram chickpeas, 1 kg potato, 120 gram oz chestnuts, 3 onions, 8 dried alycha, 2 or 3 threads of saffron, salt and pepper. The dried chickpeas must be wet overnight in cold water and then rinsed. Put the chopped onions, lamb fat and lamb into a flame-resistant dish and cover it with water 5 cm above the level of the meat. Let it slowly boil and skim off the foam from the surface for three hours. Preheat the oven to 160C, and transfer the dish in and cook it for two hours. Meanwhile, prepare the chestnuts, pierce and boil them for 5 minutes and then remove them from water and shell. Prepare a few threads of saffron and cover them with a cup of boiling water and leave them to absorb the water for 30 minutes. We are now getting closer to the end of the process. Add the chestnuts, chopped potato, alycha, saffron infusion, salt and pepper to taste the Piti that was in oven for 2 hours. But it is not the end yet, return the soup to the oven and cook for half an hour. Now, serve the hot and flavored Piti with bread, rings of raw onion and sumac and enjoy the lip smacking result.